The British & Irish Boxing Authority (BIBA) have arranged a Certified Cutman and Cornerman Course that is essential for all Cutmen and Cornermen, as well as the PA Medics Certified Head Trauma Signs & Symptoms Course that we, BIBA, feel is essential for ALL BIBA Referees and Officials, as well as Coaches, to also attend, as this course will be mandatory for all BIBA officials and cornermen from September 2018. 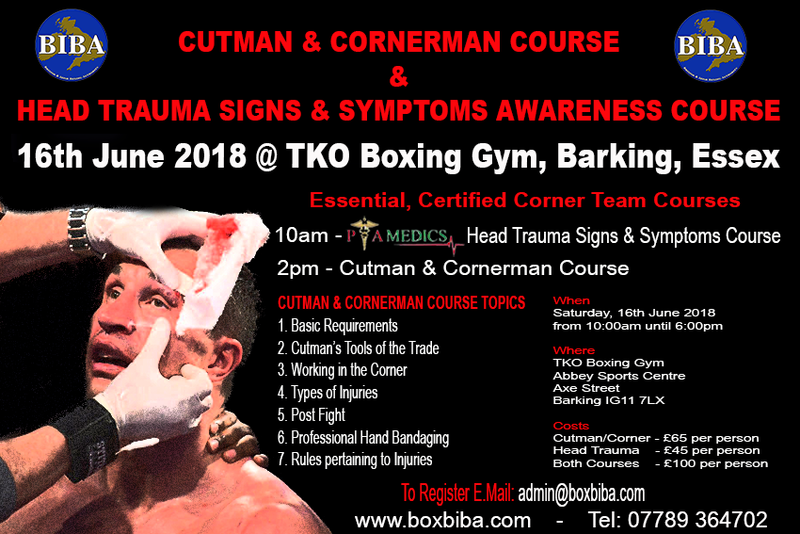 These particular courses will take place at the TKO Boxing Gym in Barking on the East London/Essex Borders on Saturday 16th June 2018. Photo ID as well as a Passport-Size Head & Shoulders Photo for Certification are required, so please bring with you on the day. ALL Referees, Officials and Coaches are welcome, don’t need to be BIBA Licensed, as these courses are essential for all involved in our sport whether Pro, Amateur or Unlicensed.